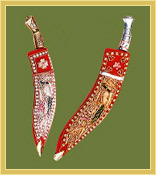 The saying is that once a khukri is out in a battle field, it has to taste blood. Khukri is primarily a Gurkha close combat weapon. It is still used by the modern Gurkha regiments. Khukri is kind of a backing weapon that is kept along with the main weapon. Its shape symbolizes the trident of Lord Shiva. The cutting action of a khukri is upward diagonal. The length is around 17". The blade is 13" made of the best quality iron. The haft can be bone or rosewood. Current day Kukries are smaller than the traditional ones. The origin of the blade is yet unknown but its shape suggests that it is one of the oldest evolved blades. 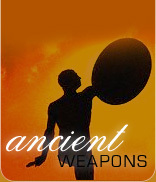 Similar shapes were used by Greeks in Greek sword of Kopis some 2500 years back. Some call it similar to Alexanderian sword and some to old Japanese sword. Others trace it to Mallas of Nepal. Whatever be the origin, it is today an out an out deadly Gurkha weapon. It is used in religious ceremonies the same as in wars.